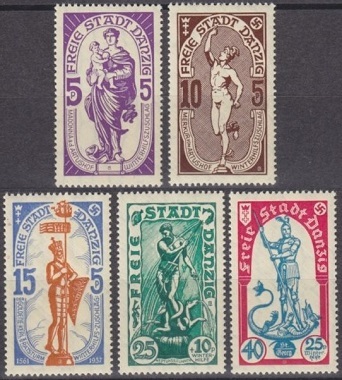 The Freistadt Danzig (Free City of Danzig) didn't issue their first stamps for 1936 until June of that year. The three stamps shown above (Mi. #259-61, Sc. #216-18) were issued on June 23, 1936 to celebrate the 125th Anniversary of the village of Brösen. 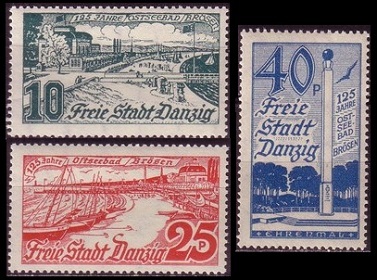 The two lower denominations of the set depict views of the beach at Brösen, and the 40 Pf. denomination depicts a war memorial located there. Originally a fishing village, in 1823 it was converted to a seaside resort for Danzig citizens. The baths and vacation cottages, located at Brösen (Brzeźno) were destroyed in 1945, and they were never reconstructed. The beaches are still a popular vacation attraction though. The five Winter Relief charity stamps, shown above (Mi. #262-66, Sc. #B15-19), were issued on November 25, 1936. The designs feature Danzig buildings, and they depict The Milk Can Tower (1517-1519), Women's Tower (1482), The Krantor (1443), Langgarter Gate (1628), and the High Gate (1588). The two stamps shown above (Mi. #267-68, Sc. #219-20) were issued March 27, 1937 to publicize the Danzig Air Defense League. The new Coat of Arms type definitive postage stamps shown above (Mi. #269, #272-73, Sc. #188, #173c, #172) were issued between April and August 1937. The 10 Pf. denomination bluish green stamp was issued in coils (Mi. #272D, Sc. #173g), with syncopated perforations, during August 1937. The two souvenir sheets shown above (Mi. #270-71 (Block 1-2), Sc. 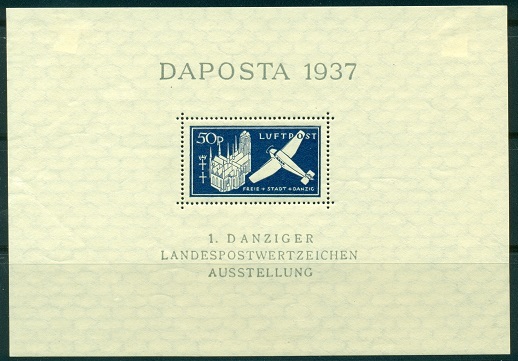 #221, #C41) were issued on June 8, 1937 for the Danzig Philatelic Exhibition. Each of the souvenir sheets sold for 1 Gulden at the exhibition, which was held from June 6 to June 8, 1937. 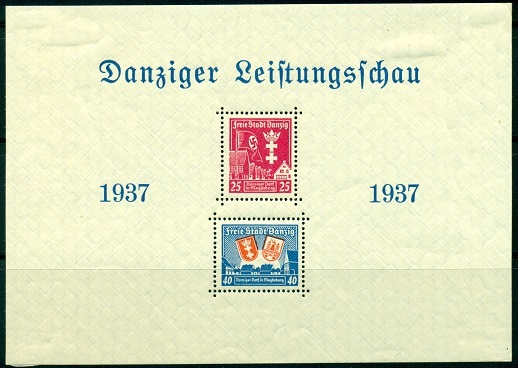 The postage stamp in the top sheet depicts St. Mary's Church in Danzig. The airmail stamp in the bottom sheet depicts another view of St. Mary's Church, alongside a Junkers W-33 monoplane. The two stamps shown above (Mi. 274-75, Sc. 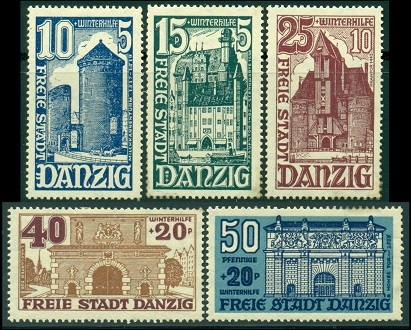 #B20-21) were issued on October 30, 1937 to celebrate the Founding of the Danzig Community at Magdeburg. The 25 Pf. depicts a NAZI flag and the Arms of Danzig above an illustration of the Danzig Community. The 40 Pf. depicts the Arms of Danzig and Magdeburg above a silhouette of the Danzig Community. 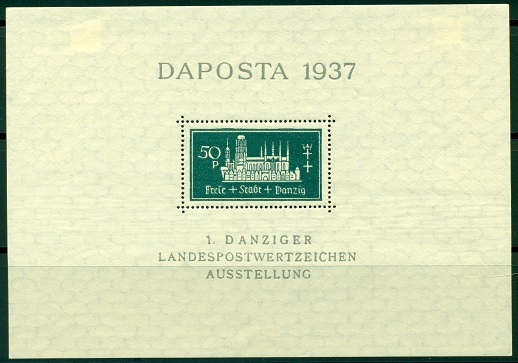 The Danzig Community at Magdeburg stamps were also issued in souvenir sheet format on November 28, 1937 for the Danzig Exhibition. The souvenir sheet is shown above (Mi. Block 3, Sc. #B21a). The five Winter Relief charity stamps, shown above (Mi. #276-80, Sc. #B23-27), were issued on December 13, 1937. The designs are from friezes in the Artushof, an elaborate building in the center of Danzig, once the meeting place of merchants and the center of the Freistadt Danzig's social life. Today, it is a museum.